Listening to our previous customers, and also to improve the quality of our service for all customers around the world, recently we just added the option of the Muslim driver in Bali. Some of our previous customers asked for the Moslem driver who will driving them to explore the island. They came from the Middle East countries and also from the South East Asia countries such as from Malaysia and Singapore. Bali is widely known as the small island dominated by Hindu Balinese people. For almost Muslim tourist, it is not easy to find a mosque for pray in the middle of their tour. Also it is not easy to find a halal food in Bali, especially in the places of interest in Bali. They need some help from their companion in the middle of their tour (the right person, of course, is their driver) to find those such places. With the help of their driver who is Muslim, the chance to find some halal foods and a mosque on their way visiting Bali places of interest would be more convenience. Not only to help you to find a halal food, but the driver can assist you with the information of the mosque (masjid). Imagine that you are traveling on Friday and you must find a masjid to do a Friday pray (shalatul jumu’ah), just after noon time. As we cannot leave this shalat so must try hard to find a masjid. Here the driver will help you, as he also must do this prayer cannot leave it. Please note that in Bali, note all of the area have masjid. And if they have there only one or two masjids. Unless you are on the area close to the Denpasar (the capital city of Bali) and round up, such as Sanur or Nusa Dua. These area have many masjid and usually it is a big masjid, so can accept many number of jama’ah. 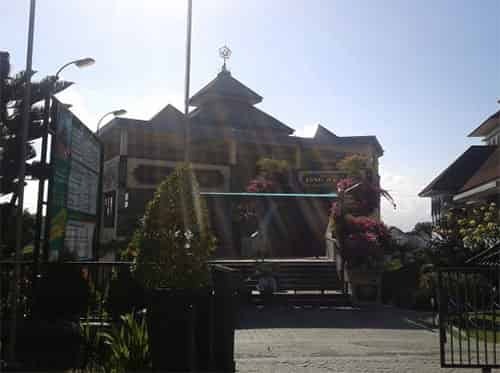 The halal food in Bali have the same conditions with masjid. Not every area have halal restaurant, or dining place. Usually, if they are selling halal food, the restaurant put a logo written ‘HALAL‘, or ‘MOSLEM FOOD‘ or something like that. That is mean that restaurant is ok to entering. Our Muslim driver’s can help you with all of this things. Guaranteed and trusted, insya Allah. So, for you will be visiting Bali island for some holiday, and need a driver Muslim as the driver to explore, we will do our best to make the person to be available. Please let us know via comment below this blog. Or, simply make a Booking via this online form. Posted in: Bali Information, Car Rental Round Up. Hi,I would like to have a Muslim driver for my trip to Bali this end of MAY.How will the cost for 3 day usage be for an Avanza all inclusive. Thank you for your request, and we just sent you the email regarding the your request about Muslim driver in Bali. Please check your email out. Salam, i would like to know the price for car rental + driver for one day. Do you have any tour itinerary? Yes we have a tour itinerary of Bali vacation, and we just sent it to your email address, as well. We noted it all for your advise, please check your email out to see our answers. We re planning to visit bali in october and we would need information regarding a muslim driver. Could you kindly send us information for rates and what they include. We are also interested in renting a villa with pool . 1. 1 day tour + airport return transfer. 2. Car rental per day and car rental for the entire period when we are in Bali. 3. Car rental + driver per day. Saya akan bercuti ke bali 14/9 – 19/9/2011.saya akan tinggal di nusa dua & kuta area.saya memerlukan muslim driver dan saya juga mempunyai itinerary sendiri sepanjang tempoh tersebut. How much it will cost and will be 2pax. hubby and i will be visiting bali early october, we would like to rent a scooter and if there is any rules in bali for foreign rider….and what is your rate for 1 day car rental with muslim driver….area to tanah lot and nearby areas…..Thank you. I’ll be travelling to Bali on the 9-11th Dec 2011 with my large family of 8 adults and 6 small children (all below 8). Do you have vehicle/s and a Muslim driver available to accommodate all of us just for a day, on the 10th dec? Hope to get a favourable reply. thanks. we are traveling from 5 to 12 dec and require a muslim driver. please advice rate. The email regarding your request has been sent to your email address. Please check it out. An email regarding the answers of your request has just been sent. Assalamu’alaikum..My family of 7 people will be in Bali from 10 Dec 2011 to 14 Dec 2011. We are looking for a good Muslim driver to drive us from our villa in Seminyak to our hotel in Ubud plus some tours along the way (13 Dec 2011 – 1 day) and also transfer from Ubud to airport (14 Dec 2011). Please send me your quote. Thank you! Thank you very much for your submission and would like to tell you that we just sent a reply to your email regarding your request about Muslim driver in Bali. Visting Bali on this coming 21november. I need muslim drivers fetch me from Bali Airport to Hotels as well other places. Halall food and Masjid most important. I need a driver for my family of 6 from 1 Nov to 6 Nov. Halal restaurants and masjid imp. Non smoking and air cond van please. What is the rate? We are a family of four and will be in Bali in mid Dec and staying in Kuta. Can you advise what is the rate of a muslim driver per day for a personalised itinerary and what is inclusive in the price. My partner and I are planning for a honeymoon trip there early next year. We have come out with our personalised itinerary and would be there for 9 days. Could you furnished us with the rate (per day, hour etc) and what’s inclusive in the price. Salam, we are going to Bali this month. i would like to know the price for car rental + driver for one day. Do you have also any tour itinerary? i will be travelling to Bali on 25th December and staying at Bali Patra for 5 days with my family ( 3 grown up children). i need a muslim driver to take us around when necassary. what will the cost be for hiring per hour with minimum booking will be 4 hours. your earliest reply will be highly appreciated. Would like to know if your driver is available on Dec/25-Dec/28/2011 for our bali trip (4 adult 1 infant). Appreciate the cost for the rental (per day/hour). I’m going to bali on 25th Dec 2011, total 3 adults + 3 children and will arrive at 12 noon. How much is the airport transfer to Tune Hotel in Kuta ? On 26th Dec I would like to rent a car with muslim driver for the whole day. Can you please help me with the requirements. I will be visiting Bali from 19/6/12 – 23/6/12. Appreciate if you could send me quote for car rental with a Muslim driver. Thank You. Quotation for 6D5N bali trip on 03 Feb 2012 to 08 Feb 2012 – driver only. I would like to know the rate for full day driver+car.. I am planning to go bali 20-23rd Jan.
What is your rate for car rent (party of 8pax) with driver? Do you have a planned itinerary too? We are 2 families from Austria. My family has got 2 adults and 2 children (aged 12 and 13), our friends are 2 adults and 3 children (aged 9, 12 and 15). We would like to rent two cars from July 11 till July 17, 2012. Would it be possible to rent one car on July 11 in Padangbai (we arrive with the ferry from Lombok) and return it in Gilimanuk on July 17 ( we take the ferry to Java). We would need the second car from July 12 Denpasar Airport (where our friends arrive), also returned in Gilimanuk. •	One big car with driver? I need to know the rate for a day tour with muslim driver n a car for 1 day. I would like to know the rate for full day (muslim driver + car) and also for half day (5 hours/day). My husband and I will be in Bali from 25/2 to 28/2. Thank u.
I’m going to Bali with my husband, 20 & 18 yr sons. Please check ur email out regarding our answers for Muslim driver..thank you for your submission. would like to have a Muslim driver and car rental for my family trip in Bali from 15 Apr – 19 Apr 2012 with own itinerary. I will provide the tour programme & accomodations soonest. 1. how can i rent car and what is your rate with driver / without driver. My hubby n I was in Bali from 24/02/12 to 27/02/12. We would like to extend our thanks to Pak Haliman from Bali Car Rent for arranging the best Muslim driver Pak Andy throughout our stay in Bali. Pak Andy is not only a driver but also a very good tour guide n very informative about Bali. With him, we have no worry of where to go or eat during our stay. All we need is to enjoy our ride from the time we start the day till we were safely back to hotel. Pak Andy will do the itenerary n he sure know the best n a must place to visit while in Bali. Even our stay is a short one but a very memorable one. We manage to visit quite a number of places n capture the beauty of Bali from our lens. We will definately be coming back to Bali n will use the Bali Car Rent for our future stay in Bali. Thanks once again to Pak Haliman n give our regards to Pak Andy. I would like to know the costs and charges of a Muslim Driver for 1 day tour and for 6 pax. What will the itinerary be? Please respond. Thank you for your kind attention. I would like to hire a Muslim driver from 11 April 2102 to 15 April 2012 for my Bali trip. Please email me for the details. Your prompt response is highly appreciated. Thanks! We planned to visit Bali from 18/3/2012 – 21/3/2012, and we looking for Muslim Driver and Tour guide during our stay. Could you email me the itineraries (package available) and fees for your Muslim driver and car. It just only two of us. 3-does it hv limit of tour?certain hours/places? I and husband present honeymoon to Bali from 7 to 10 april 2012 and require a muslim driver. please advice rate. I and husband present honeymoon to Bali from 7 to 10 april 2012 and require a muslim driver for 1 day tour (10 hours). please advice rate. I would like to have a muslim driver from 14th to 17th May 2012 for 2 paxes. Thanks. I wish to have a muslim driver for my trip to Bali this coming 5/4 – 8/4. Could you also include in the itinerary for those days too. I will be staying at Keraton Jimbaran Resort & reaching Bali on the 5/4. may i know charge for muslim driver per day? Hi, My wife and i will be visiting bali on the 1st until 4th may 2012. We would like to have a good muslim driver troughout the period. May i know how much does it cost? Hi, can you recommend me a good muslim tour guide for my bali trip this 9th of June. Hope to hear a reply soon. I would like to know the cost and charges of a muslim driver for one day tour and half day tour for 3 pax. We have come out with our own personalized itenerary during our 5D 4N stay in Bali. ( i.e from 28.5.2012 to 1.6.2012 ). We are visiting Bali from 11/06/2012. What is rate for a driver for 2-3 days tours. do you conduct tour for 8 persons. Could you please let me know if you have a muslim tour guide/driver available on 27 May 2012? Hope to hear from you asap. Thanks. can you recommend me a good muslim tour guide for my bali trip on 16th January 2013 till 19th January 2013 for 4 pax. Hope to hear a reply soon.May i know how much does it cost? Appreciate you can email me quotation refer to below details. 2. 5adults and 2 child’s , 6 and 4 years old. 4. Prefer hotel near market. 3 star should be ok.
5. harga untuk mobil, supir/guide, dan BBM. 6. entrance fee, dance fee, donation, dan tip. Saya dan suami akan ke Bali pada 31/8/2012 to 3/9/2012. pickup/transfer airport to hotel and coluld you quote for me a day tour (private tour by request ). Kami sekerluarga 2 dewasa & 3 kanak2 akan bercuti ke Bali dr 3 dec – 8 dec, memerlukan kereta sewa n supir muslim. Brapa harga sewa elf + muslim supir + bbm utk 1-3 hari ? Mohon diemelkan harga sewa satu kenderaan untuk 3 – 6 Disember 2012 utk 3 dewasa dan 2 kanak-kanak. Need a muslim driver asap as i wil arrive in bali tomorrow evening. Pls revert asap plus how much does it cost?? We are planning to visit Bali from 24 may to 27 may 2013. Altogether there are 9 members in our group. We would like to request for a van plus a Muslim driver to assist us while staying in Bali. We plan to visit places of interest in Bali. Kindly gives us your itenenary and quotation. Thank you. Hi, will be heading to Bali in Sep 2013 and would like to request for the services of a Muslim driver + car for 2 persons. Duration is for 1-2 days. Look forward to a reply, thanks! An email regarding the request of muslim driver in Bali has been just sent. Sorry for some delay of response.